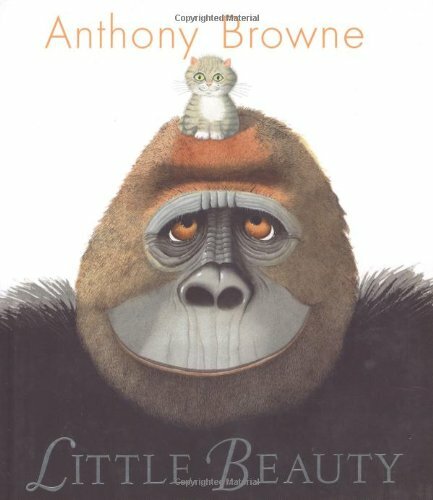 The latest book from Anthony Browne features another of his captured gorillas. Browne has himself captured the animal with such photographic verisimilitude and sheer, bulky thereness that you feel he could clamber off the page. Here the gorilla is the lonely subject/victim of a sign language training programme, which enables him to tell his keepers that he needs a friend. They respond by providing him with Beauty the kitten, and they live happily together until the gorilla smashes the tele after watching King Kong. The keepers’ response this time is to threaten to take Beauty away. The text of the simple surface story is just over 200 words long, but as always with Browne, other narratives pullulate between the foreground figures and the background details of his illustrations. The theme of sweet friendship between Beauty and the beast, its fragility indicated by visual analogies with the King Kong and Icarus stories, is accompanied by multiple hints at the cruelty of human kindness. Curious readers will probably discover questions that should bring them back to the book again and again.